Kids love to collect keychains and your zoo animal-lovin', keychain-collectin' child will be excited to add this adorable little plush giraffe keychain to his or her collection. Cute and cuddly from every angle, this giraffe stuffed animal keychain is sure to delight with its soft spotted fur, cream and dark brown accents, fun loopy mane and sweet face. And there are no worries about for your new pet breaking through your ceiling as this little giraffe is perfectly content to simply lie on its tummy or sit up and watch you when it's not adventuring with you on your backpack, purse, belt loop, or simply looped around your finger. Throwing a zoo-themed party? 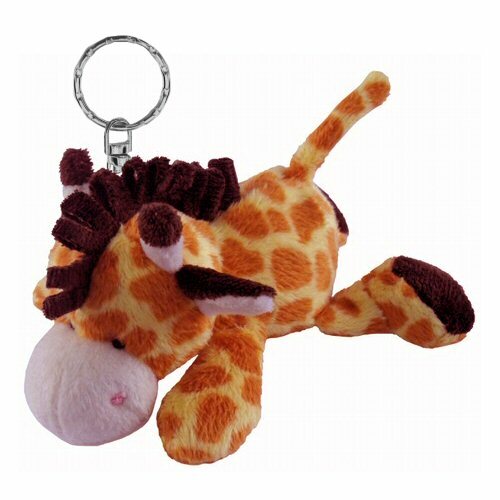 Giraffe plush keychains are also great for birthday treat bags, prizes, and giveaways! Fun Facts about Giraffes: Did you know that the giraffe is the tallest mammal in the world? It's true! In fact, just their legs are taller than most people. Talk about an animal to look up to! Gallop, this adorable Dreamy Eyes stuffed giraffe, has soft spotted fur, cream accents, dark brown hooves, fluffy brown mane and tail tuft, and big sleepy brown eyes. This adorable little stuffed giraffe from the Handfuls collection is all smiles and hugs. Our Sweet & Sassy stuffed giraffe is vibrantly colored with soft blue fur that has fun swirls. This Savannah in Pajamas Bloco foam building set includes instructions for a cheetah, zebra, giraffe, and snake. Create a fabulous safari or zoo themed room with this adorable Giraffe fabric wall art. This adorable Giraffe Sudden Shadows giant wall decal will add a huge splash of safari whimsy to the wall of any room. This cute little tiger plush keychain has soft orangy-tan fur, white accents, and a sweet face.